Mini Gan is geared for campers ages 18 months to 4 years old. If your child is 5 years or older, please visit our Summer camp page here. Our experienced counselors provide fun, love and care in a specially designed program where our youngest campers get a real summer camp experience. Mini-Gan is the perfect blend of a safe preschool environment and a fun outdoor camp. In addition to the familiar centre playtime, circle time, playground time, and crafts, campers partake in special camp workshops and theme activities each day. Mini-Gan activities include Sports, Nature, Art, Splash Pool, Gymnastics, Food art, Baking, Creative movement, Water slides, Sprinklers, Music, and more. Mini- Gan will run from Tuesday, August 6th to Friday, August 16th 9am - 1pm. Extended care is available till 3pm. 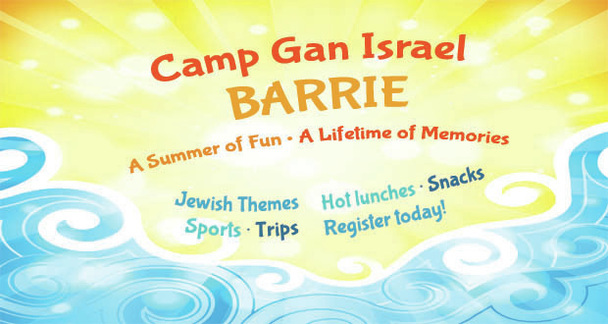 The camp fee below includes all camp activities, Jewish themed activities, swimming, arts & crafts, baking, sports, daily Kosher lunch and snacks and much more. We make an effort to make our programs affordable to everyone. We leave it up to you to decide which option to choose. Option 1 - Full tuition: $225 for the session. Option 2 - Subsidized tuition: $195 for the session. Extended care is an additional $45 for the session. An early bird discount of $20 will be given for registrations received before April 15th. Each sibling registered will receive $15 discount. Note: No Jewish child will be turned away due to lack of funds. If you or someone you know is in need of financial assistance with the camp fee, please let us know and we will do our best to accommodate. To register your child/ren to Mini Gan, click here for our Camp Registration page.